On the way to Insadong-gil, we passed by Gwanghwamun. Located at Seoul Jongnogu, Gwanghwamun is the main and largest entrance to Gyeongbok Palace of Joseon Dynasty. The latest reconstruction of Gwanghwamun was done in 2006. The wooden structure of Gwanghwamun was rebuilt and the stone base was replaced with concrete. 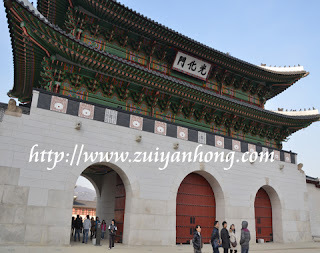 The restoration of Gwanghwamun was completed and opened to public in 2010. Nearby landmarks include Somerset Palace Hotel, Central Government Complex, Sejong Cultural Centre, US Embassy and Japanese Embassy. The nearest subway station is Gyeongbokgung Station. You can board a line 3 subway to Gyeongbokgung Station. Walk for five minutes from exit 5, Gwanghwamun will appear on your left.